The final day of the Pan American Games 2011 equestrian show jumping competition in Guadalaraja, Mexico today [Oct. 29] was reserved for the individual competition and the USA was looking forward to another clean sweep — but this was not to be. 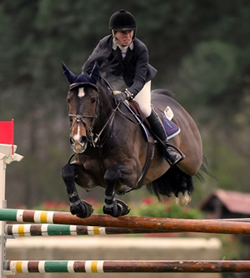 Bermuda’s Jillian Terceira [pictured] and her horse Bernadien were placed in eleventh going into the final day which consisted of two rounds of jumping for the top twenty five placed riders after the end of the team competition. Unfortunately Bermuda’s other representative Patrick Nisbett and Cantaro did not make the cut. The scores from the previous rounds were carried forward and Jillian was in the middle of the pack in 11th place with a score of 9.24 penalties. In the first round Ms Terceira and Bernadien had one rail down for four faults and one time penalty giving her a total of 14.24 and a place of 12th overall. Three US riders still held down the first three places, but were closely followed by riders from Brazil and Canada, the latter being six time Olympian Ian Millar, and this illustrates the quality of the field. The final round proved to be very exciting with Captain Canada Ian Millar withdrawing his horse prior to the start of the round. Ms Terceira was 14th to go and in the words of Chef d’equipe Heidi Mello they did a beautiful round incurring only two time penalties and being only one of five to complete the round without jumping penalties. Her score of 16.24 was good enough for a final placing in eighth. This excellent result ensures that Bermuda has gained a spot in equestrian show jumping for London Olympics 2012, but the island will only be able to send one individual rider. Sincere congratulations to you, Jillian. Is any Government grant money left for a sport that has somebody producing results or has it all been wasted away on soccer & cricket which have produced nothing but prima donnas, & the hordes of ‘support’ people traveling around the world? Government policy or the lack of it has pitted sports against each other. With people such as yourself making negative comments about fellow sports organisations. Sport should bring people together. You might want to stop being divisive. Its the olympics clown. Check the BOA. Congratulations Jillian!!! Well done indeed!! Go Jill. Best of luck. Jill – you have made all of Bermuda and all your ‘supporters’ SO proud of you! You have won the right to represent our ‘Little Engine That Could’ in the Olympics! And you have done your bit for our Tourism efforts – by turning the eyes of the world of sports on our island! I hope Bermuda realises the significance of this stellar accomplishment in a major equine World class event. Jillian placed ahead of EVERY Canadian including the #1 World ranked…….to see Bermuda in the top ten is hugely impressive!